E-bikes will be added to Holiday Valley’s mountain bike rental fleet. E-bikes will make the trip to Spruce Lake achievable by most intermediate bikers, and then they’ll follow the mellow flow trail that crisscrosses the slopes and winds its way back down to the base. Holiday Valley has been a mecca for mountain biking ever since Western New York Mountain Biking Association built 35 miles of singletrack in the state forest land adjoining Holiday Valley property for more advanced riders. 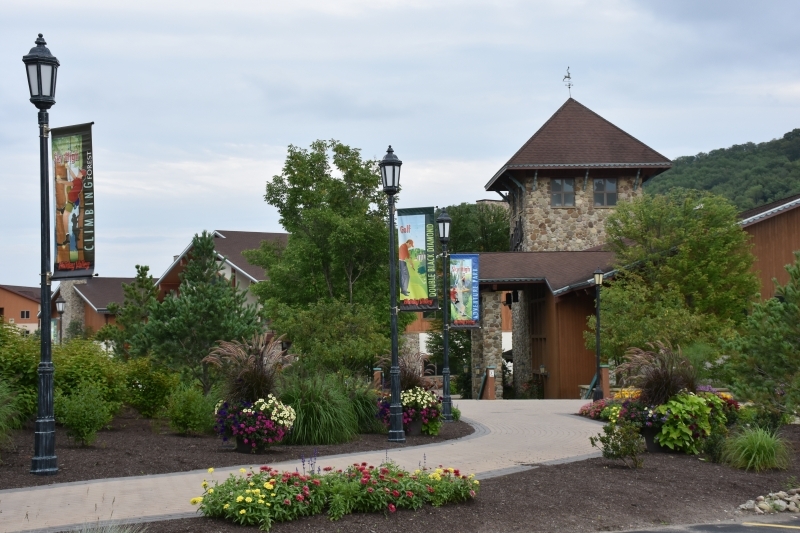 The trails at Holiday Valley are free to ride; we just ask that you stay out of Sky High and the golf course. Sky High Adventure Park includes the Aerial Park, the Climbing Forest, the Sky Flyer Mountain Coaster and Mr. Happy Gem Mining. The Aerial Adventure Park is the largest in New York State and third largest in the US with 13 courses of varying difficulty, 173 obstacles, and 43 zip lines. The resort recently installed several True Blue auto belay systems where instead of zip lining to exit a course a climber JUMPS off the final platform. The True Blues lower the climber at 6 feet per second. It's a thrill, for sure! Located next to the Aerial Park, the Climbing Forest offers a 3-D climbing wall with the climbing holds strapped to tree trunks. There are 9 trees to climb of varying difficulty to challenge kids (age 5 and up) and adults alike. Mr. Happy Gem Mining Company was added to Sky High last summer for children as young as 2. The experience mimics old fashioned panning for gold where you start with a bag of sand that contains either gems or fossils. Miners wash the sand away in a sluice and the treasures are left in the pan. An identification card is included for children to learn more about their gems or fossils. The Sky Flyer Mountain Coaster is 4,800 feet in length with a downhill track of 2,940 feet and a drop of 283 feet. The track consists of 15 curves, 12 waves, a jump plus a huge spiral, and carves a beautiful path through the woods of the resort that everyone in the family will love. And since the rider has control of the speed of their car, one can choose to race down the exciting track or sit back and enjoy the scenery! Holiday Valley's Double Black Diamond course is 6,500 yards of scenic and challenging golf. The course, which hibernates under the lower ski slopes, winds across the rolling terrain to create 18 holes to remember! Each hole has 4 sets of tees that will challenge the low handicapper, yet allow less experienced players to enjoy the course as well and keep the pace of play moving. Golf outings starting as low as $67 per person (including cart, dinner and tournament assistance) are a great way to get your ski club, customers or friends together during the summer months. Our Master PGA Professional, Steve Carney and his assistants are available for golf lessons for golfers of all skill levels. The Holiday Valley pool complex is open from Memorial Weekend through September 2nd. Guests can relax at a lap pool, toddler pool, and an activity pool complete with a diving board and slide. The complex is the social hub of the Ellicottville scene with poolside food and beverage service from the Cabana Bar and John Harvard's Brew House. Adventurers can enjoy stand up paddleboarding and kayaking on Spruce Lake on weekends starting June 23rd at the top of the mountain. Rentals and lessons are available by appointment through Adventure Bound in Ellicottville, 716. 217.4047. Chairlift rides on the Spruce Lake chair will be available on weekends starting August 3rd. Riders can then choose to take the lift back to the base or hike down one of the many scenic trails at Holiday Valley. EXTREMELY FUN events happen throughout the green season at Holiday Valley, starting with the Happy Half Marathon on May 11th. The annual Mudslide Obstacle Trail Run on June 15th is an obstacle race that’s really, really FUN. Yes, you'll get muddy, yes there is running, yes there are up to 14 obstacles but NO fire, NO barbed wire and NO electric shocks! Runners can choose the mostly downhill 3.5 mile course or the more challenging 5.4 mile course. July 5th through 7th is the wonderful Summer Music Festival with performances on the slopes by Don Felder, formerly of the Eagles on Saturday night and the Buffalo Philharmonic Orchestra followed by a spectacular fireworks show on Sunday night. August 10th and 11th brings the annual Taste of Ellicottville, where the many fine restaurants of town bring their specialties to the streets. Everyone’s favorite, Fall Festival is October 12th and 13th with a street fair in the Village and chairlift rides at Holiday Valley. Leading up to the ski season, the Beer and Wine Festival weekend is November 8th and 9th with Friday night’s Trucks ‘n Brews party and Saturday’s beer tasting event. Holiday Valley is Western New York’s largest year ‘round resort featuring 60 slopes and trails, 13 lifts, 3 base lodges, slope side lodging and dining, conference facilities, an 18 hole golf course, a tree top aerial adventure park, a mountain coaster and a summer pool complex. Holiday Valley is New York State’s most visited ski resort. Holiday Valley Resort in Ellicottville is on the web at www.holidayvalley.com. Detailed media information is available at www.holidayvalley.com/media.